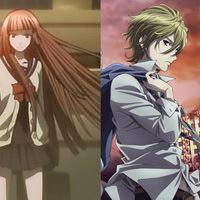 We love Zetsuen no Tempest because of its complex and sophisticated storytelling, the wonderful setting, the music and of course the characters. Fuwa Mahiro is an aggressive and sharp guy who is very intelligent and exactly knows what he wants. His sister Aika is a witted girl with a high intellect and a love for shakespeare. Watching those two interact with each other has always been a delight. I wanted to cosplay as Mahiro no matter what, because while being damn cool he also looks extremely hot and I like his hairstyle and red eyes. Also his sister complex (he's just madly in love with Aika but denies it) is quite cute and amusing. Aika on the other hand is just beautiful and always angering her brother in a sophisticated and sometimes unworldly way. The costumes are mostly handsewn, except for a few pieces of clothing we already had at our hands. Eloo to all people, call me Buck. Soul Eater - Maka & Soul The cute, cool, dynamic dream-team! The relationship between Maka and Soul and the overall Anime got us into this cosplay. 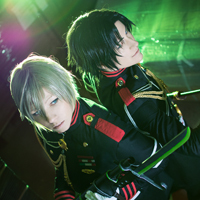 Guren and Shinya warehouse shooting This was our "getting to know each other" photoshooting with Roxy Photography feat. her girlfriend as Yuuichiro!